Filter by Account Format Standard Collector Ed. Attention :This version of Generation Zero is for PS4 and many of the stores listed on Gocdkeys offer a version in account format. The PS4 and Xbox One accounts give access to the game simply by accessing them through a username and password that you will receive by email after purchase. These versions may have a regional lock and are marked with the "Account Format" label in our price list. If the store does not have a tag, it means that the game is a physical version or a version in key form, which we simply need to enter into our account, PSN or Microsoft, to activate it. 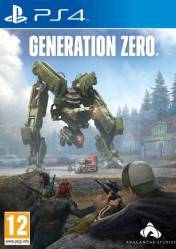 Generation Zero is an RPG, with high doses of the survival genre, in which we will find ourselves in a huge and vast open world in which hostile machines have taken control, at the purest Terminator style. Now, it is necessary to counterattack and unravel the mystery of what is really happening. Using battle-tested guerrilla tactics, you'll be able to attract, paralyze or destroy enemies in intense skirmishes. In addition, we'll be able to form small cores of resistance along with three other friends and counterattack together to defeat the machines. to achieve our goals and overthrow the machines, we'll need to collaborate and combine our unique skills and as we defeat the robots, we'll need to get hold of the spoils they guard. There are no comments yet about Generation Zero. You can be the first one!